Yocan is back at it with a new vaporizer design sure to make any vaper happy. The Yocan Evolve 2.0 Vape Pen takes all the functions from standard ecigs, salted nicotine pods, and dab pens, to bring you an all-in-one vaping experience you are sure to love. Three different coil pods allow the user to choose between a multitude of vape juices while still being able to vaporize solid concentrates such as wax and shatter. Simply choose the pod for the correct product, fill and vape away! It couldn't be easier with the Yocan Evolve 2.0 Vaporizer Pen added to your collection. What's going on everyone? Token With Todd here from Myxed Up Creations. Today we're going to be talking with you about the Evolve 2.0. It's a brand new vaporizer from Yocan. It comes with a 3-in-1 vaping system. It'll smoke your nicotine vapes. It'll smoke your salted vapes as well as waxes and shatters in the new coil system. Today what we're going to do is we're going to open it up, show you all the different features, the batteries and all the extras that come with it. If you guys enjoy these little videos, make sure you're hitting that subscribe button so you don't miss out on anything. Stay tuned. This is the Evolve 2.0. Thanks for sticking with us everybody. Here we have the Yocan Evolve 2.0, super nice little vape. Let's go ahead and open it up, shall we? There it is. I'll go ahead and put the lid to the side here. This is our Yocan 2.0 3-in-1 vaporizer, really nice unit. This one here is a rose gold. It's a real nice little unit there. Let's go ahead and set that down. In the box you're also going to get a couple different things. You're going to get your how to use pods card. It's going to show both your regular nic and salted nic pods as well as your coil pods for shatters and waxes. I'm going to set that down. Now we have our Yocan Evolve 2.0 instructional manual. This you're going to want to keep a hold of. It's going to go through all your different parts, functions, how to use it, how to fill, what each pod's for. You'll definitely want to keep this thing. We'll go ahead and keep going here as we jump in. Here we have your Evolve 2.0 cartridges. These cartridges, you're going to get 3 different ones in your Evolve 2.0. These two cartridges here are going to be for your E-juices like nicotine vapes. Your white one or clear one here on this side has a smaller hole on the side. This is going to be more for your regular styled nic salt E-juices. You're also going to have your green top here which is a thick oil pod. You could do a thick THC oil or something like that. Your thicker juices you'll want to put in here, or even a high VG juice. Your third tank is actually already here on top of your vape battery. To remove it, you're just going to pull off the top just like that. It's magnetic, very simple to do. Then these pieces actually just pop off here and you can see right down in the coil there. This is a dual quartz coil there that you could see on the bottom. This would be designed for your shatters, waxes, hash solid concentrates, things like that. Once you would put your product in there you would just drop your top right back on there and then magnetically insert right into your lid. You're also going to be getting a USB charger in your kit, micro USB, pretty standard in the vape community. If you've got a nice Android or a lot of different charging units today, they usually use a micro USB, so pretty easy to get. Now when you want to use this guy, what we're going to do here is we'll go ahead and turn this one on. You get five taps on the button and then it flashes on. Now when I tap the button you can see that it turns on. Five more taps and it'll flash at you and now it'll turn itself off so when I touch the button it doesn't turn on. We'll go ahead, one, two, three, four, five, turn it back on here. Now what I'm going to try to do is just pull off the regular top and leave the coils in here. Let's see if I hold the button down and show you guys just how it heats up. You can see there it's starting to heat up. You've got a little bit of glow in there. There it goes. I want to get it closer to the camera for you. There we go. Very nice, heats up very quickly. Make sure when you're filling this that you don't touch the coils. You don't want to poke the coils in there. You also don't want to touch any metal to it while it's on. It got a little out of focus there. Very easy to use. Put our lid back on here. Five more taps, one, two, three, four, five, and it'll flash at you. Check out the full transcript and more over on our website. Three different coil pods allow the user to choose between a multitude of vape juices while still being able to vaporize solid concentrates such as wax and shatter. Simply choose the pod for the correct product, fill and vape away! It couldn’t be easier with the Yocan Evolve 2.0 Vaporizer Pen added to your collection. What’s going on everyone? Token With Todd here from Myxed Up Creations. Today we’re going to be talking with you about the Evolve 2.0. It’s a brand new vaporizer from Yocan. It comes with a 3-in-1 vaping system. It’ll smoke your nicotine vapes. It’ll smoke your salted vapes as well as waxes and shatters in the new coil system. Today what we’re going to do is we’re going to open it up, show you all the different features, the batteries and all the extras that come with it. If you guys enjoy these little videos, make sure you’re hitting that subscribe button so you don’t miss out on anything. Stay tuned. This is the Evolve 2.0. Thanks for sticking with us everybody. Here we have the Yocan Evolve 2.0, super nice little vape. Let’s go ahead and open it up, shall we? There it is. I’ll go ahead and put the lid to the side here. This is our Yocan 2.0 3-in-1 vaporizer, really nice unit. This one here is a rose gold. It’s a real nice little unit there. Let’s go ahead and set that down. In the box you’re also going to get a couple different things. You’re going to get your how to use pods card. It’s going to show both your regular nic and salted nic pods as well as your coil pods for shatters and waxes. I’m going to set that down. 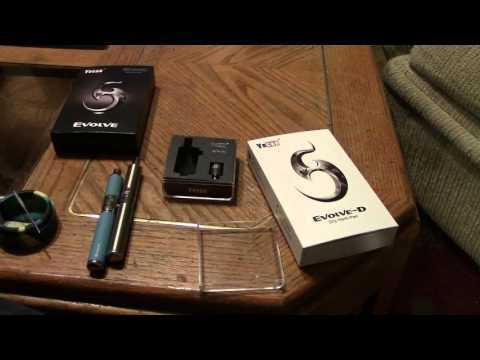 Now we have our Yocan Evolve 2.0 instructional manual. This you’re going to want to keep a hold of. It’s going to go through all your different parts, functions, how to use it, how to fill, what each pod’s for. You’ll definitely want to keep this thing. We’ll go ahead and keep going here as we jump in. Here we have your Evolve 2.0 cartridges. These cartridges, you’re going to get 3 different ones in your Evolve 2.0. These two cartridges here are going to be for your E-juices like nicotine vapes. Your white one or clear one here on this side has a smaller hole on the side. This is going to be more for your regular styled nic salt E-juices. You’re also going to have your green top here which is a thick oil pod. You could do a thick THC oil or something like that. Your thicker juices you’ll want to put in here, or even a high VG juice. Your third tank is actually already here on top of your vape battery. To remove it, you’re just going to pull off the top just like that. It’s magnetic, very simple to do. Then these pieces actually just pop off here and you can see right down in the coil there. This is a dual quartz coil there that you could see on the bottom. This would be designed for your shatters, waxes, hash solid concentrates, things like that. Once you would put your product in there you would just drop your top right back on there and then magnetically insert right into your lid. You’re also going to be getting a USB charger in your kit, micro USB, pretty standard in the vape community. If you’ve got a nice Android or a lot of different charging units today, they usually use a micro USB, so pretty easy to get. Now when you want to use this guy, what we’re going to do here is we’ll go ahead and turn this one on. You get five taps on the button and then it flashes on. Now when I tap the button you can see that it turns on. Five more taps and it’ll flash at you and now it’ll turn itself off so when I touch the button it doesn’t turn on. We’ll go ahead, one, two, three, four, five, turn it back on here. Now what I’m going to try to do is just pull off the regular top and leave the coils in here. Let’s see if I hold the button down and show you guys just how it heats up. You can see there it’s starting to heat up. You’ve got a little bit of glow in there. There it goes. I want to get it closer to the camera for you. There we go. Very nice, heats up very quickly. Make sure when you’re filling this that you don’t touch the coils. You don’t want to poke the coils in there. You also don’t want to touch any metal to it while it’s on. It got a little out of focus there. Very easy to use. Put our lid back on here. Five more taps, one, two, three, four, five, and it’ll flash at you. Are the cartridges refillable in that? Do you have a shop? I need advice.